TNPSC Recruitment 2018: Good News for those Candidates who want to get PSC Jobs in Tamil Nadu State. The Tamil Nadu Public Service Commission is inviting to Graduation Jobs of TNPSC Recruitment 2018. The interested and eligible candidate can take an advantage of 1199 vacancies of TNPSC Department. The TNPSC Department will be organized recruitment of Combined Civil Services Examination-II for Group-II Services. 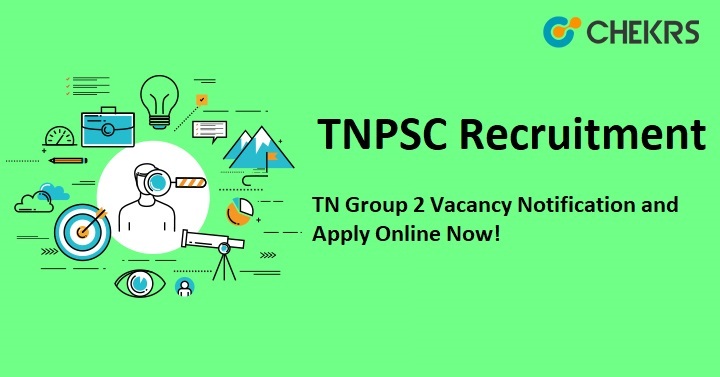 The Last Date of TNPSC Group 2 Recruitment 2018 Application Form is 9th September 2018 through online mode. This article has information about complete information such Name of Organization, Name of Post, Number of Vacancies, Job Location, the method of applying for an application form, official website link, etc. SC/ ST and PH candidates are exempted from the examination fee. Firstly the candidate goes to the official website of TNPSC. Click on the “Notifications” button and the new web page will be open. The candidate must read recruitment notification carefully. Now Click on the “Apply Online” and Registration portal will be open. New Candidate Click on “One Time Registration” button. Compete their Registration process and Then click on “Apply & Click Here for Payment” link. Application Fee will be deposited through the online Banking. Remarks: The Candidate wants to search more information about TNPSC Recruitment 2018. They can visit our website that is www.jobs.chekrs.com and collects upcoming recruitment notification and vacancies news. If you have any query about TNPSC Recruitment that you can write comments on commenting box and take a review or feedback.